SWATCHES - I Blog, Therefore I Am. My super wedding planner told me in our first meeting that I should check first the fabric availability of my wedding "theme" before I get excited with it. I was also told by three designers that my taste for my bridal gown and entourage ensemble is more 'western' compared to most Filipino brides so fabric sourcing as early as now is a must. We technically don't have a wedding theme but we intend to play our weddings with fresh light colors. I specifically want a combination of very light Spring colors that will be contrasted with bright Spring colors of flowers. I came across the combination in Pinterest way before Witt proposed. I can't even remember when I pinned it. I struggled a lot with the 3rd color from the left. I can't exactly pinpoint the right color term for it. Some call it Light Mauve and some said that it is Light Old Rose. 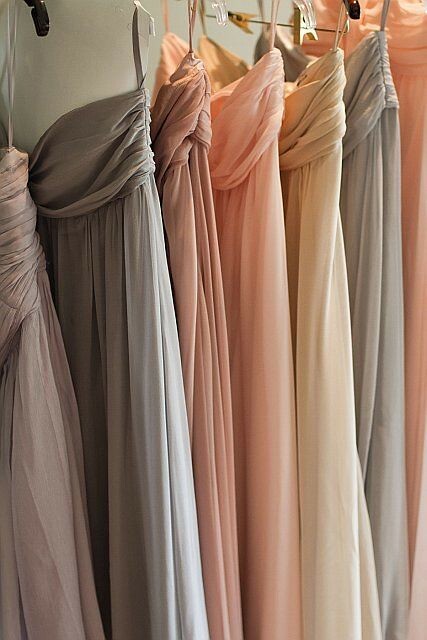 I'm planning to have my Matron of Honor and Godmothers in Light Grey, Bridesmaids in Light Mauve, Secondary Sponsors in Light Blush, and Junior Bridesmaids, Flower Girls and Moms in Creme. My wedding planner advised me to visit Fabric Warehouse to see if my planned colors and fabrics actually exists. Lo and behold...it does! It truly gave me great joy to see that my planned wedding swatches can actually see the light of day here in the Philippines. The closest matches are numbers 37, 52, 65 and 24. The photo above is saturated a bit but it's lighter in person. 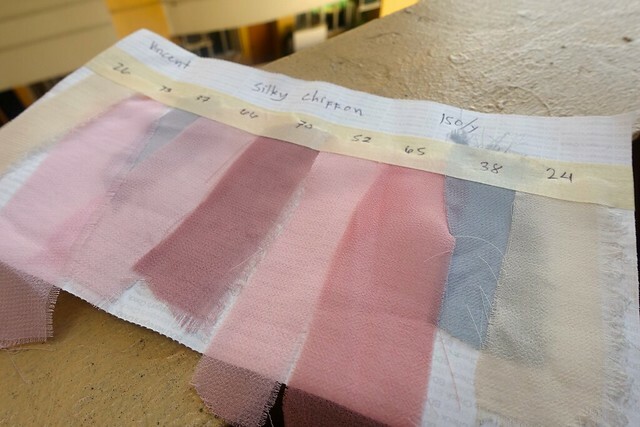 These are silky chiffon fabrics but a couple of designers already told me that I have to consider Power Mesh/Tool fabric if I want a flowy effect for my girls' gowns. I've been obsessing over this for quite a while. Next step is to find THE ultimate designer who will execute my vision!